The new G-28/M110A1 uses an aluminum upper receiver, weighs 8.4 lb unloaded and 15 lb loaded with accessories, fires a 7.62 x 51mm round, and is designed to pick off enemy forces from 800 meters away. In May 2018, the U.S. Marine Corps began fielding the M110A1 to swap out its legacy M110 rifle. Earlier that year, the Army announced the M110A1 would be first tested then fielded with infantry squads. 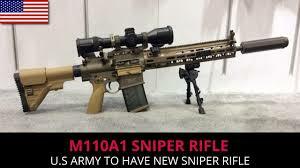 The M110A1 is expected to replace the Army's Mk 14 Enhanced Battle Rifle, fielded since 2009. At Fort Carson, Colorado, elite Army snipers of the 4th Infantry Division's 2nd Brigade are testing the M110A1, reported War Is Boring. Snipers have already fired 8,000 rounds, testing different firing positions, along with various accessories to increase lethality. According to the National Interest, the Army alleges the new sniper rifles "increased accuracy, plus other ergonomic features like reduced weight and operations with or without a suppressor."